Liberal Democrats are a danger to all of us. The lessons are staring us in the face. This is what liberal Democrats offer America. Obama, Hillary, Elizabeth Warren and the new Democrat hero Alexandria Ocasio-Cortez all offer socialist policies. They want desperately to destroy or badly damage capitalism. The same capitalism unleashed by President Trump that has resulted in the lowest black unemployment in history and a historic 400% increase in black business ownership in one year. Why would anyone want to change those results? There is no need to guess if the socialist policies of today’s Democrat Party work. Venezuela was the richest country in Latin America only 20 years ago. That’s when they practiced capitalism. Then socialist Hugo Chavez took over. He modeled Venezuela after the Cuban model. Today there is no food on shelves…very little water…no gas available in an oil-rich country…no toilet paper. The proud people of Venezuela are eating out of dumpsters and garbage cans. Days ago, it got much worse. The socialist president of Venezuela Nicolas Maduro devalued the currency overnight by 96 percent. This is one of the largest currency devaluations in world history. Inflation is now officially 1 million percent in Venezuela. But have no fear. Venezuela’s socialist leader introduced bold new policies to save the country. His solutions to the unfolding disaster? Higher taxes, subsidized gas prices and a massive minimum wage increase. Do you recognize those solutions? Those are the exact prescriptions of Democrat politicians in America. Every Democrat running for president in 2020 offers the same tired socialist solutions. They all propose higher taxes, more regulations, more government control, higher minimum wages, free or subsidized everything- from free college, to free healthcare, to free universal income, to subsidized solar panels and electric cars. But why go all the way to Venezuela to see the model. Just look at Chicago. Almost 60 more black Chicagoans were shot this past weekend. There is a black genocide. Over half a century of 100% Democrat rule. Do the people of Chicago seem happy? But the best story is yet to come. This is the story that says it all about how wrong liberal Democrats are about EVERYTHING. A young, liberal, vegan couple from the DC Swamp took a bike trip through the Central Asian nation of Tajikistan to prove the world is a wonderful place. Jay Austin and Lauren Geoghegan both quit their jobs last year to make this bike trip of a lifetime. In their blog, they said they wanted to “share the openheartedness and acts of kindness” in the world. How sweet. 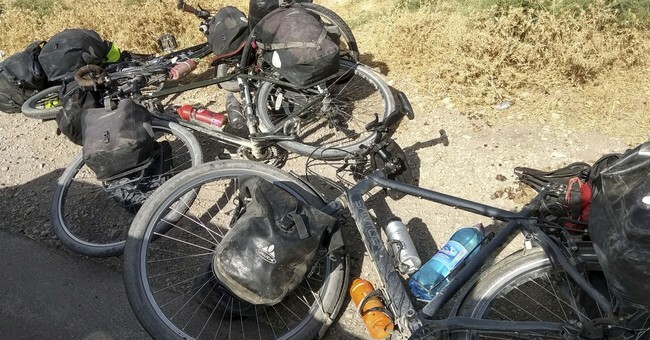 Their dream trip came to an end on July 29th when Islamic terrorists rammed their bikes, knocked the two naïve liberals to the ground, then five men got out and stabbed them to death. ISIS has since taken credit. This at its core is what liberalism leads to. Those two naïve (now dead) liberals-in-love had the same beliefs as those who want to defund our military. The same beliefs as those who want to open our borders. The same beliefs as the people who want us to destroy our nuclear arsenal and “trust the universe.” These are the same kind of people who want to take our guns away. These are the same kind of people who want to import millions of Islamic refugees into our country- without extreme vetting, without knowing if they have violent intent, or if they want Sharia Law, or if they hold hateful views toward Christians, Jews and America. These stories are proof positive that liberalism is a danger to all of us. Liberals and their moronic ideas will make us poor, miserable and may even get us killed.